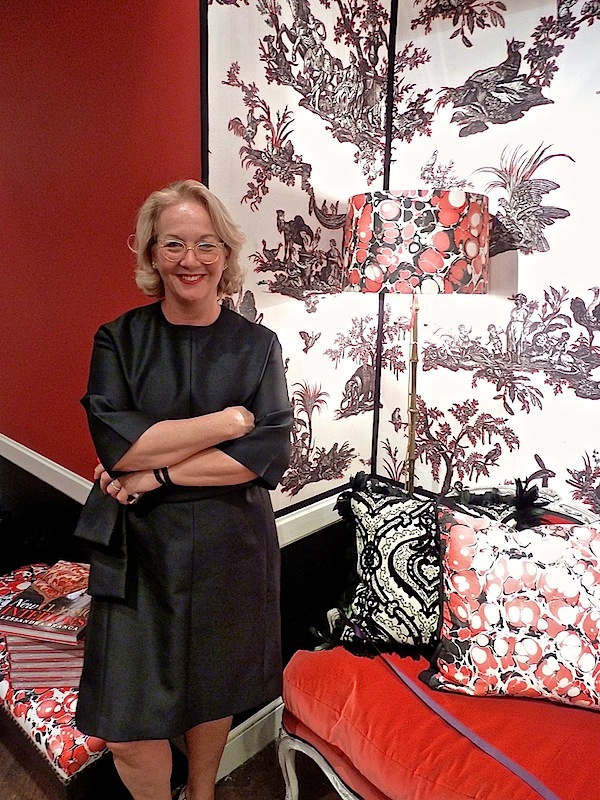 Not only has Alessandra Branca launched her fabulous new fabric line with Schumacher, but she also partnered with Bergdorf’s to transform the always tempting seventh floor with her new fabric and home collection. Last week I stopped by for the official launch party – a festive evening well attended by a who’s who crowd of NY design. 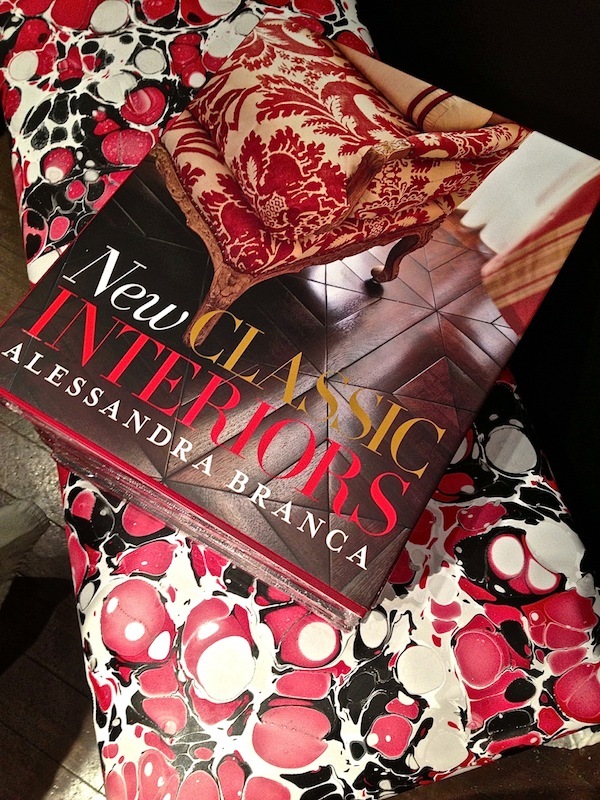 It was the perfect venue for Branca, above, to show how her bold take on classically inspired color and pattern makes for an über stylish environment. 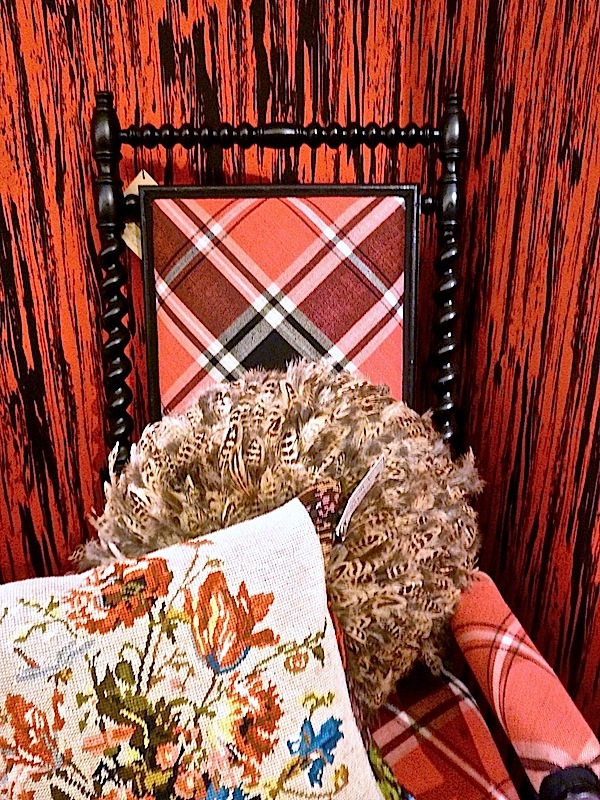 Below, her gorgeous Bosco porcelain collection, embroidered Stag’s head cocktail napkins and striped iPad cover sit in front of an antique chair upholstered in her Alexander Tartan Rouge and walls dressed with her fabulous faux bois cotton. Everything looks better against faux bois! 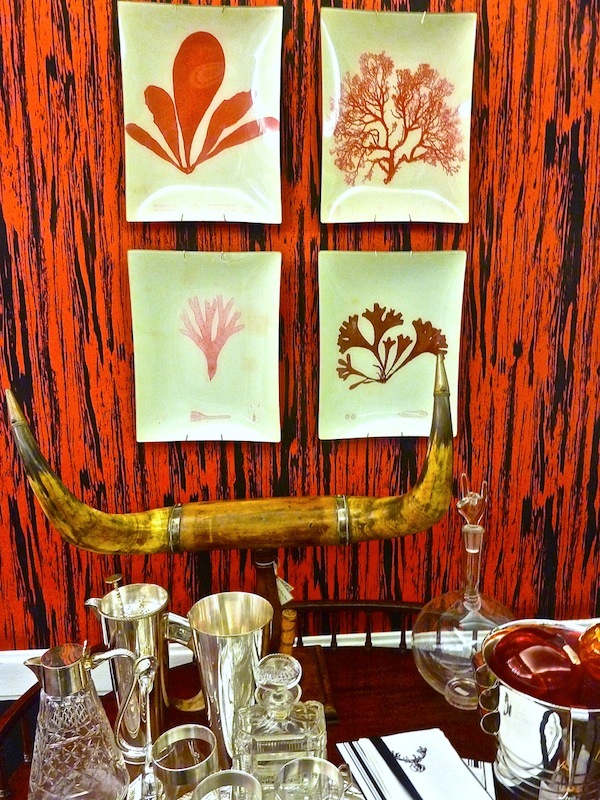 Throughout the floor, voluptuous vignettes showed off Branca’s mix of old world craftsmanship with livable modern chic. 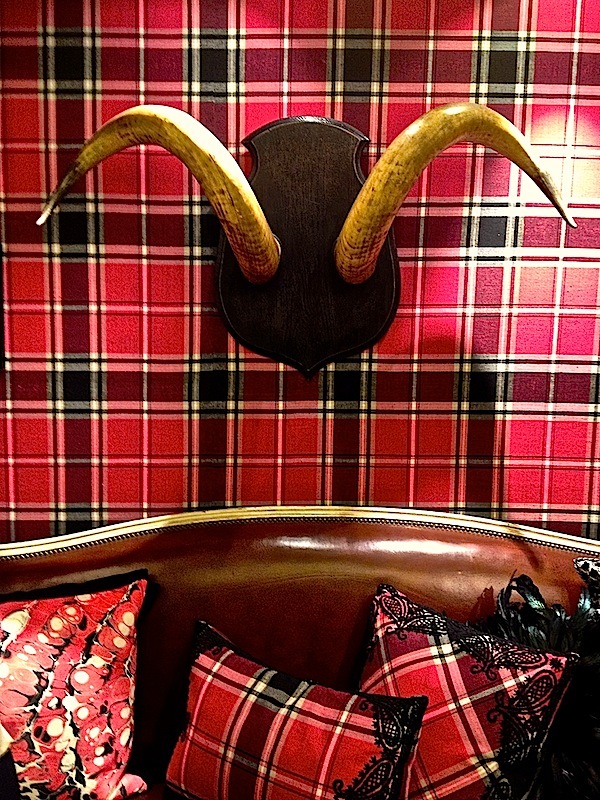 There’s no culture clash here where pillows featuring Indian paisley detailing sit on a leather upholstered French settee against her modern take on Scottish tradition on the walls. 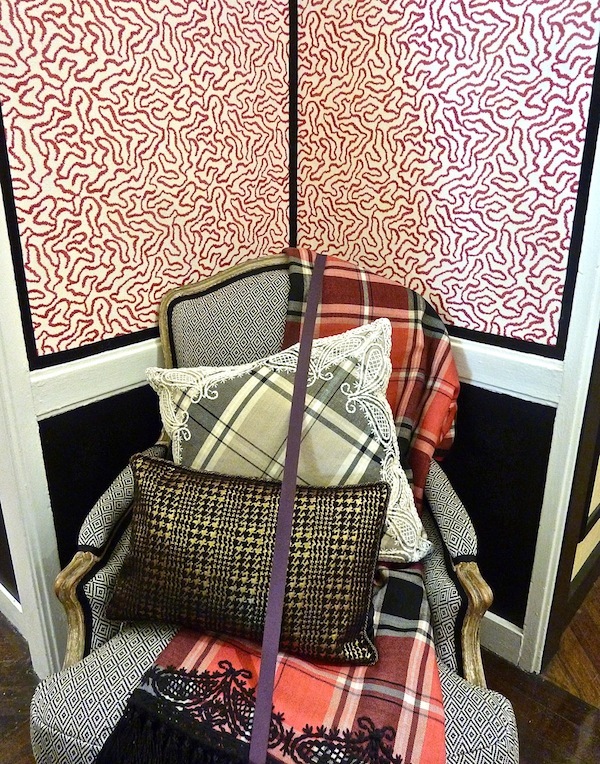 Embroidery plays a robust role in Branca’s new collections. Here you can see the detailing of her intricately embroidered Continenti toile, based on an 18th century design but blown up in scale for a fresh take on tradition. Or the charming Corallina, which even though full of movement, proves to be the perfect foil for a lively grouping from the collection. The Marmo collection includes a spectacular Napoleon III ebonized banquette upholstered in the hand-marbelized pattern in a show-stopping leather. Of course there were copies of Alessandra’s book available for signing. 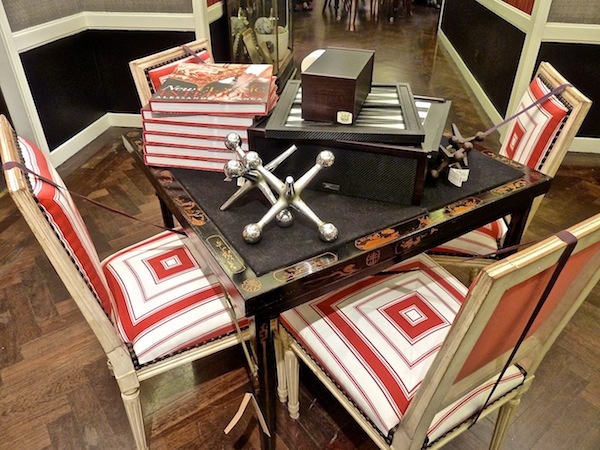 Old meets new in this set of six painted antique Louis XVI style dining chairs upholstered in the Rouge Branca Stripe with nail head trim. But I think my favorite table was in the back where chair cushions in the exquisite acid green Elizabeth starred in this dramatic setting. Not quite sure how Alessandra gets it all done but a huge congratulations to the designer for a brilliant showing at the elegant Fifth Avenue emporium! 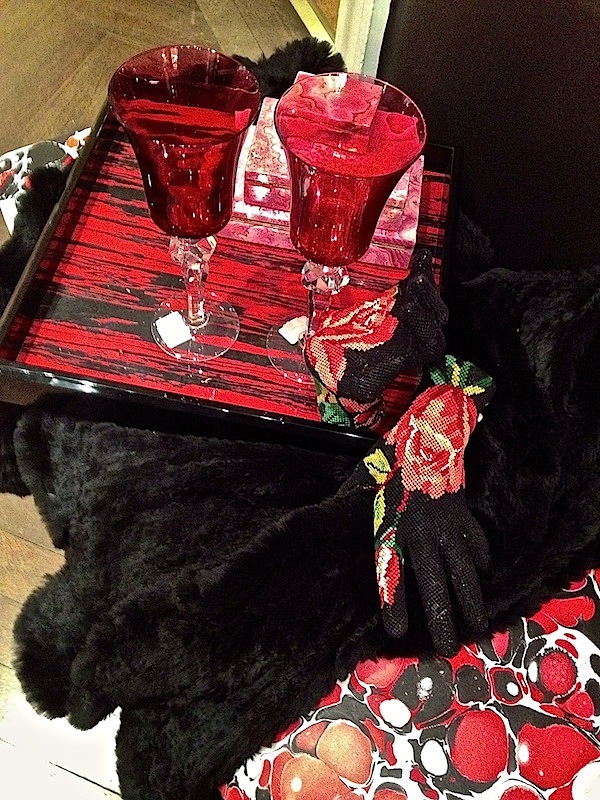 This entry posted in books, design, gifts, interior design. 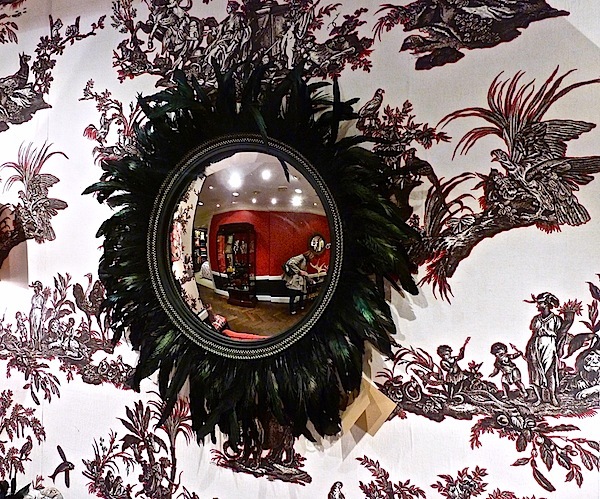 Entry Tags: Alessandra Branca, Bergdorf Goodman, Designer fabrics, interior design, NYC shopping Bookmark the permalink. OMG! You must have been on visual overload…my favorites are the pillows with the plaid and lace…GORGEOUS and the best is that black and gold (metallic??) herringbone pillow!!! franki p.s. did I mention I’m crazy about pheasant feathers!!! Lovely and livable, what a great collection. 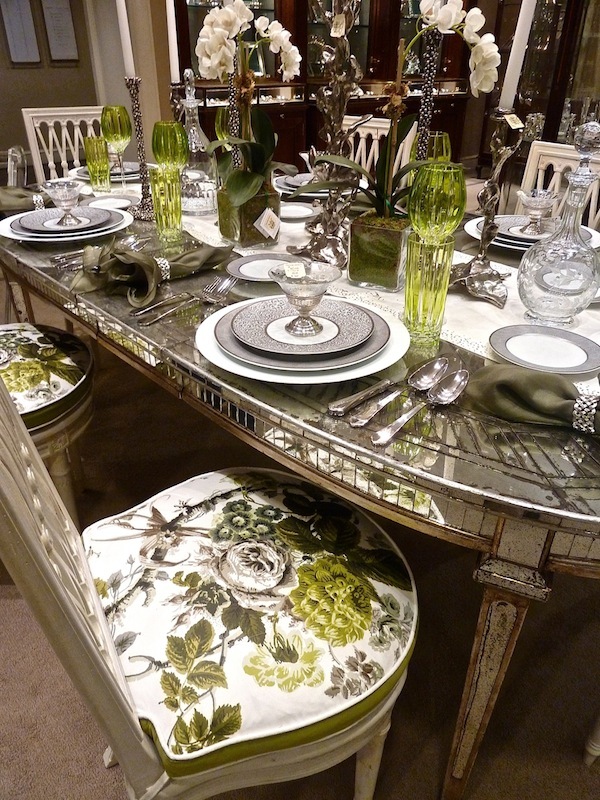 I’m with you, love the shock of green on that wonderful dining table. So fresh. I love everything she creates, and tartan is by far my favorite. 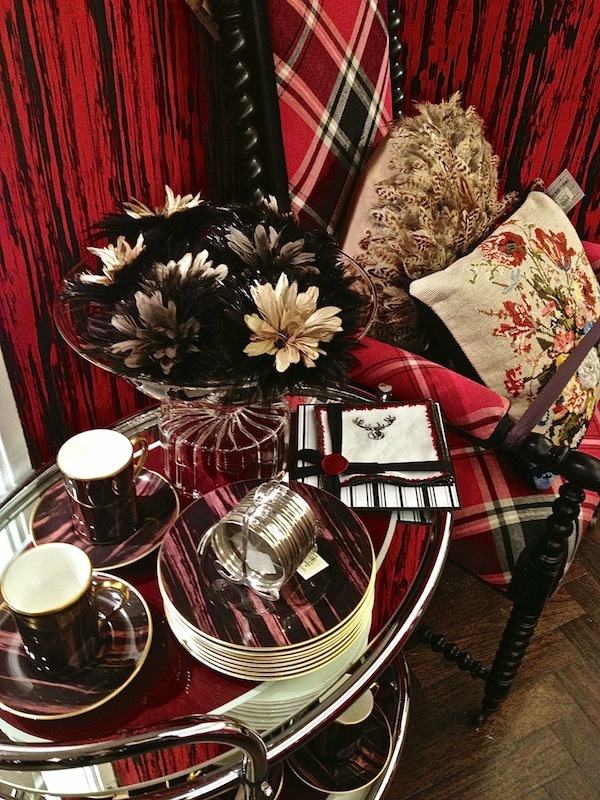 The red settee is to die for. For certain will be getting the book. What a perfect place to make your debut and Alessandra’s hall is fabulous! So much fun to see our orchids in that last picture. Alessandra simply gets it right–always! 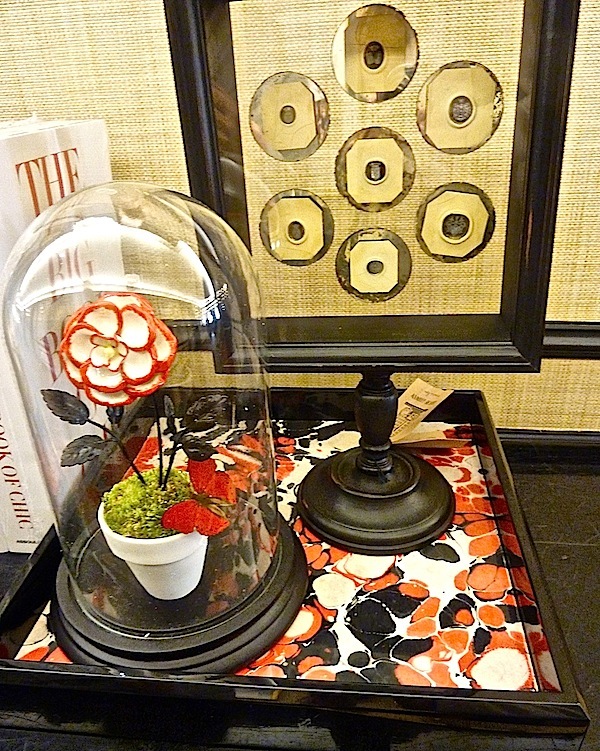 Stacey this collection by Alessandra is so amazing and seeing it carried over into so many fabulous accessories, love it! Gorgeous gorgeous post and Alessandra is just one of the best in the business, period. Thank you! 78 queries in 0.743 seconds.